Located a few miles away from Padua, it was the set of the 2004 movie The Merchant of Venice starring Al Pacino and directed by Michael Radford. This is a unique pearl among the Italian renaissance architecture, one of the most magnificent and unusual old aristocratic mansions both of Veneto and Italy. Unlike most ancient villas of Veneto, it was not planned to combine relaxing moments with farm work: thus there are no barchesse, the lateral buildings used as stables and to store farm equipments. 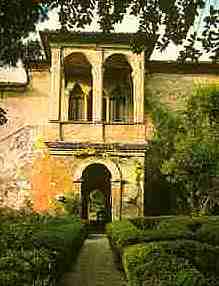 The manor house was commissioned in 1568 by Gabriele Capodilista, a nobleman from Padua. It rises close to the ruins of a medieval castle, where an imposing medieval tower stands. On the ground floor the villa boasts an elegant portico on each side, whose walls are decorated with friezes, floral decorations and scenes from the roman history and mythology. Some of the internal halls are also embellished with paintings, dating back to the 1500s as well. 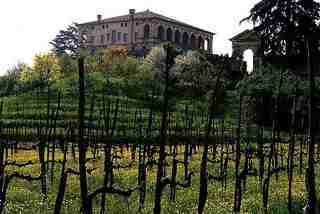 The villa estate was awarded the 3 Bicchieri by Gambero Rosso - an Italian authority concerning wine - for its wine produced in loco. Nowadays the villa is available for weddings, parties and business conventions. In the medieval complex inside the villa property, besides 4 apartments available for renting equipped with any comforts, there are also an agriturismo (italian for a family owned farm also running a restaurants offering typical wine and food), and a small exhibit displaying ancient farm tools. An imposing yet elegant mansion immersed in the rolling Euganean hills and overlooking the still rural surrounding landscape. The villa – a splendid example of Veneto Renaissance style - features a neoclassical style, clearly inspired by the ancient roman architecture. The name Vescovi means bishops: in fact it was commissioned by Francesco Pisani, Bishop of Padua. Afterward it was inhabited by other prelates. 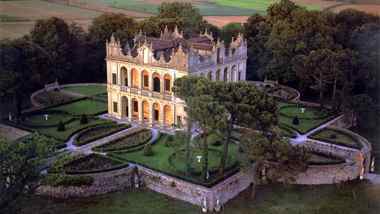 The villa – whose original design dates back to 1474 - was built from 1525 to 1567 over the ruins of a former middle ages castle, and it is characterized by loggias and arcades alternated with elegant pillars. Inside, some of the walls are finely decorated with 1500s’ paintings depicting landscapes and mythological settings, ascribed to the Dutch painter Lambert Sustris (but today it is mostly believed that the artist may be the Verona painter Gianbattista Zelotti). The villas and the surrounding park are currently closed to visitors for remodeling, allegedly until Spring 2011. The name comes from the Tuscan Poet Francesco Petrarca, who fell in love with the enchanting small town of Arquà and moved there, living in this house since 1369 after having remodeled it. So if you decide to see the villa, I highly suggest taking into accounts a visit to quaint Arquà Petrarca as well. This awesome villa is a rare example left of a country house dating back before 1500s, so it’s something unique in the Villas Veneto category. 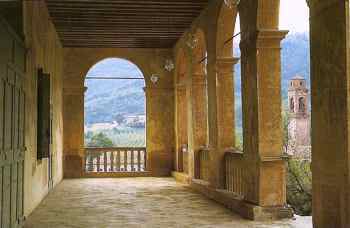 It was built in the 1200s’, and despite the following interventions done in the 1500s, like the addition of the central 2-arches loggia, the house has kept its medieval appearance, like the the gothic windows, commissioned by Petrarca himself. The house itself is a small museum: besides enjoying the same bucolic view as Petrarca used to from the windows, still there are the studio of the poet, his chair, his bookcase. And...his legendary embalmed female cat.